With two weeks to go before the transfer window closes, David Moyes is looking to bring in a couple of his former players. 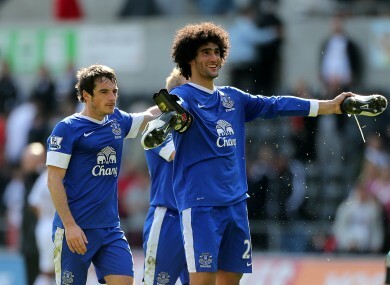 Everton pair Fellaini (right) and Baines. MANCHESTER UNITED HAVE had an offer of £28m (€32m) for Everton’s Marouane Fellaini and Leighton Baines turned down. Having failed in their attempts to sign a number of midfielders including Thiago Alcantara and Cesc Fabregas, David Moyes has gone back to his former club in the hope of bringing Belgian international Fellaini to the Premier League champions. A statement released on their website this afternoon reads: “Everton can confirm that it has received bids from Manchester United for two players. Those bids were immediately rejected out of hand as derisory and insulting. Toffees boss Roberto Martinez claimed last week that Fellaini’s buyout clause had expired at the end of July while full-back Baines has been a long-term target and United have already had a bid of around £12m for the England defender rejected earlier this summer. They will need to up their offer substantially if they want to add both players to their ranks before the transfer window closes on 2 September. Email “Everton reject £28m Man United bid for Fellaini and Baines”. Feedback on “Everton reject £28m Man United bid for Fellaini and Baines”.